Prolonged blood pressure (BP) elevation causes changes in the structure and function of cardiovascular organs. Therefore, our research group focused on young patients with prehypertension. One third of young adults with prehypertension have a hyperkinetic circulation characterized by increased BP and heart rate. In such patients sympathetic stimulation is increased, whereas the parasympathetic inhibition is decreased. This strongly suggests that the abnormality originates from the brain (medulla oblongata) where the sympathetic and parasympathetic tones are regulated in a reciprocal fashion. 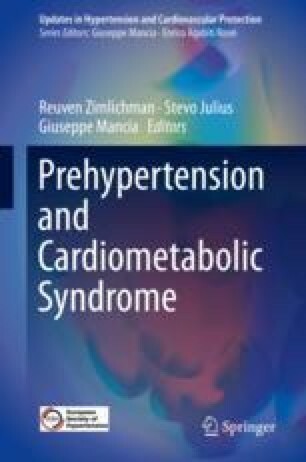 Patients with hyperkinetic prehypertension are not hyper-responders to stressors, and there is no evidence of increased BP variability in response to various stressors. Rather, in prehypertension the brain operates in a normal fashion around a preset higher basal BP level. In achieving the higher BP goal, the brain shows a remarkable plasticity; if the stressor is associated with increased cardiac output and that increase is blocked (by beta-blockers), an equal BP increase will be achieved by a higher vascular resistance. Similarly, if the original stressor induced increased vascular resistance and this was blocked (with alpha-blockers), the same degree of BP elevation will be achieved by increased cardiac output. It was suggested that the hyperkinetic BP elevation may be a stressful response to the invasive hemodynamic measurement (cardiac and arterial catheterization). However, in the Tecumseh study, we used a noninvasive method of measurement, and, akin to invasive procedure, 37% of young adults with prehypertension had a hyperkinetic circulation. These patients had elevated BP at 5, 8, 21, and 23 of age, and their parents also had higher BP. Overall these findings prove that the brain plays an important role in the pathophysiology of one third of patients with prehypertension.